This year I feel I’m in much better cycling shape than I was last year – I haven’t been doing massive amounts of training but at least I have been out for a spin at least once a week for the past month or two. It’s a far cry from going into it completely cold with no time in the saddle in months last year! 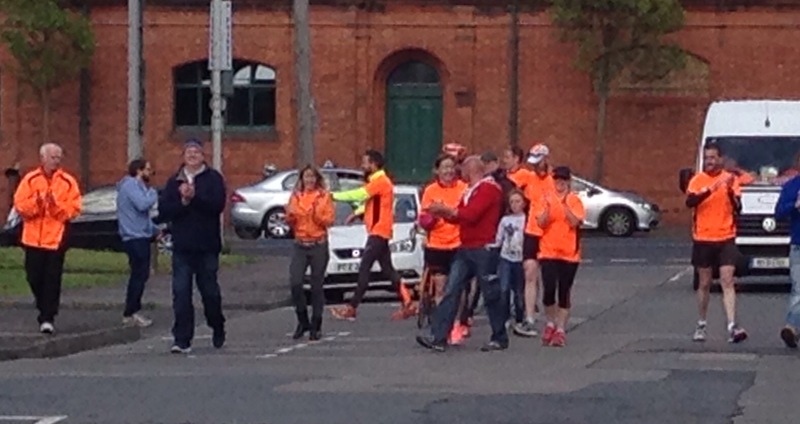 Earlier today I was at the NI Fire Service for the final stretch of the Run for Cycle Against Suicide where Jim Breen and his team ended their gruelling ultra endurance run of the cycle route. Crazy, and respect to him for running day after day, and for even looking at a bike never mind getting on one tomorrow. A big thanks to Christopher, Helen and Barry who are hosting and feeding a bunch of us here in Belfast – your food, beds and hospitality are greatly appreciated! Good luck everyone taking part, and thanks to all the volunteers who make it happen.